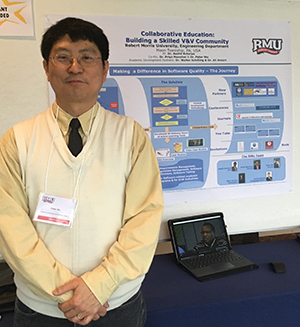 On March 15, 2016, RMU held a Research & Grants Expo in Sewall Center highlighting a variety of faculty research and grant projects. All of the RMU campus was invited to attend to learn more about the research going on here at RMU. The CIS Department’s own Dr. Fred Kohun was a speaker/panelist, along with other faculty members from RMU, CMU, and Pitt for a Panel Discussion titled Research First or Grant First: The Dilemma. Several other CIS faculty members showcased their research during the Poster Exhibition at the event, which highlighted 39 research posters and 13 grant-funded research posters. Dr. Peter Wu presented his research titled Making a Difference in Software Quality – The Journey, a grant-funded research project that he co-authored with Sushil Acharya (SEMS, Engineering), Priyadarsdhan Manohar (SEMS, Engineering), Connie Ruzich (SCIS, Communication), and Mary Hansen (SESS, Education). Software quality is a crucial issue in software development. Industry’s general lack of appreciation of verification and validation (V&V) benefits, and more importantly the shortage of V&V practitioners poses a multitude of problems in the software industry. This project will improve software education at the undergraduate level and enhance on-the-job professional training, thereby increasing the pool of professionals with V&V knowledge and skills. 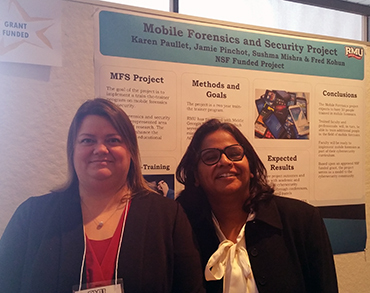 Dr. Jamie Pinchot presented her research titled Mobile Forensics and Security Project, an NSF grant-funded project. Dr. Pinchot is a Co-PI on the grant, along with Dr. Karen Paullet (PI), Dr. Sushma Mishra, (Co-PI), and Dr. Fred Kohun. Mobile security and forensics is an underrepresented area of study and research. This research will advance both knowledge and education in the field of mobile cybersecurity and mobile forensics by creating an online Mobile Forensics and Security certificate program and developing a train-the-trainer program for Computer Information Systems faculty. The researchers will be involved in training an additional 50 faculty members from universities across the country in mobile security and forensics. 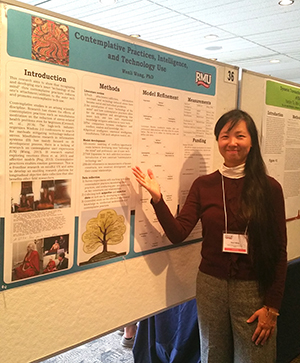 Dr. Wenli Wang presented her grant-funded research titled Contemplative Information Systems Use – Find the Balance from the Inside Out. Technology addiction, technology-induced stress, and information overload have become both individual and societal problems. With a combination of economic analysis of opportunity cost, experiential learning, and cognitive reflections, this research aims to demonstrate that recognizing and developing one’s own inner “technology of the mind” through contemplative practices would reduce a technology user’s attachment to the outer technology. Dr. Wang’s research will examine the roles of spiritual intelligence, emotional intelligence, and mindfulness in mediating the relationship between contemplative practices and technology use. This entry was posted in faculty, faculty research on March 22, 2016 by Dr. Jamie Pinchot.